Integrity, as defined in Wikipedia is a concept of consistency of actions, values, methods, measures, principles, expections and outcomes. In ethics, integrity is regarded as the honesty and truthfulnessof one's action. The definitions seems to be easy to understand but the question is, do we have this positive trait? Our integrity can be measured on the number of promises we have done against the quantity of which we have broken. 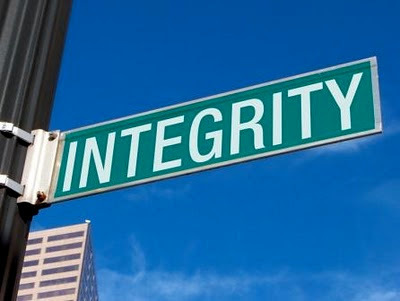 When we have integrity, we are respected and we have self respect. 1. Blesses Us. In Proverbs 20:7 (The righteous man leads a blameless life; blessed are his children after Him), it describes here that if we are obedient to all His commands and teachings, an overflowing of blessings will be given to us. We should walk in faith with Him and let Him lead us to His path. 2. Judges Us. Job 31:6 - "Let God weigh me in honest scales and He will know that I am blameless". In everything we do, we are answerable to all our actions and these actions will evaluate us how we live our life and what kind of relationship we have with Him. We should always be consistent and don't fall on negativity and don't let others influence you. 3. Protects Us. Psalm 25:21 - "May integrity and uprightness protect me, because my hope is in you". Once we have integrity, we are protected as we are bound with all the positive attitudes for showing our values and honesty to everyone. As long as we are doing the right thing, we don't have to worry on what will will happen the next day as we have Him in our life. 4. Guides Us. Proverbs 11:3 - "The integrity of the upright guides them, but the unfaithful are destroyed by their duplicity." By doing only right things all the time will provide us a guide in every situation. Since the experience of being with Him and living in a rightful way, our decision making becomes matured, more passionate in doing good things and that we have these guidelines on every action we take. In this fast pacing world right now, we might encounter several situations where choices can be made on how to react on it. With our conversation to others and all the words we are using, are we honest enough? Integrity is a simple word with variety of explanations and definitions but I think the simple way to have it is to do the right things all the time. I admit that I am still a work in progress and it's not easy but we have options and we have God who is always watching us.